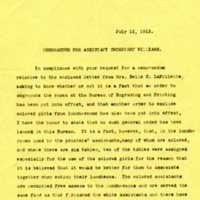 Memorandum for Assistant Secretary Williams regarding segregation at the Bureau of Engraving and Printing. Memorandum for Assistant Secretary Williams. In compliance with your request for a memorandum relative to the enclosed letter from Mrs. Belle C. LaFollette asking to know whether or not it is a fact that an order to segregate the races at the Bureau of Engraving and Printing has been put into effect, and that another order to exclude colored girls from lunch-rooms has also been put into effect, I have the honor to state that no such general order has been issued in this Bureau. 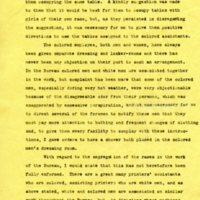 It is a fact, however, that, in the lunch-rooms used by the printers' assistants, many of whom are colored, and where there are six tables, two of the tables were assigned especially for the use of the colored girls for the reason that it is believed that it would be better for them to associate together when eating their luncheons. 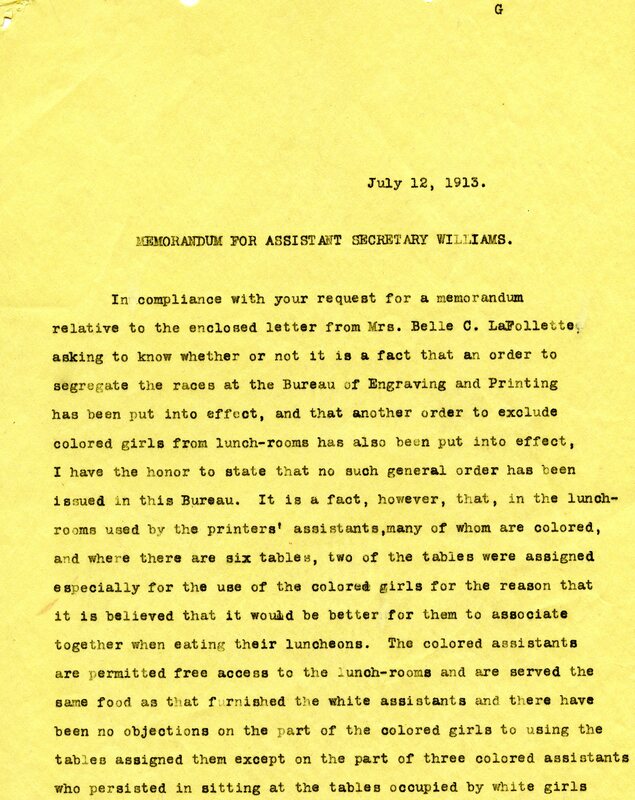 The colored assistants are permitted free access to the lunch-rooms and are served the same food as that furnished the white assistants and there have been no objections on the part of the colored girls to using the tables assigned them except on the part of three colored assistants who persisted in sitting at the tables occupied by white girls after one or two of the white girls had made an objection to them occupying the same table. A kindly suggestion was made to them that it would be best for them to occupy tables with girls of their own race, but, as they persisted in disregarding the suggestion, it was necessary for me to give them positive directions to use the tables assigned to the colored assistants. 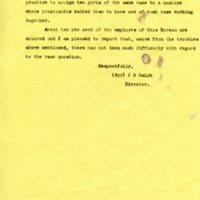 The colored employes, both men and women, have always been given separate dressing and locker-rooms and there has never been any objection on their part to such an arrangement. 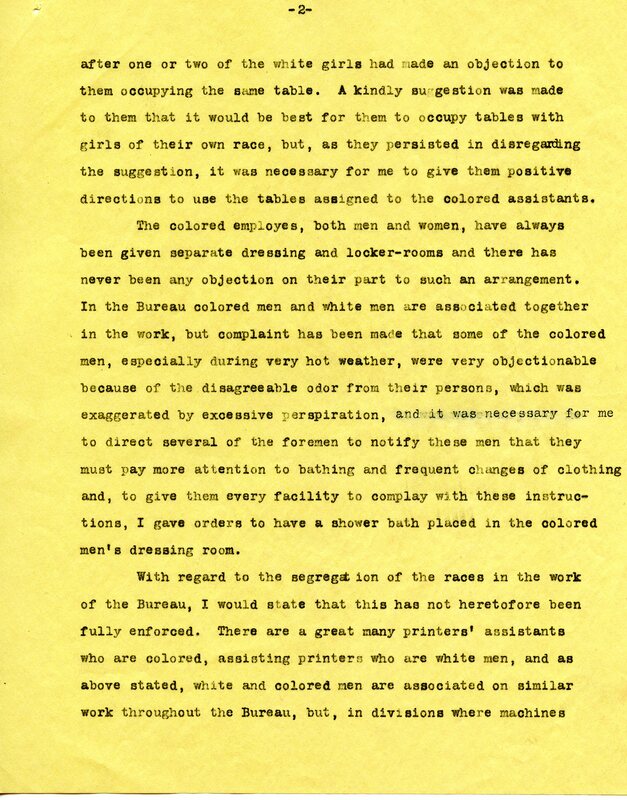 In the Bureau colored men and white men are associated together in the work, but complaint has been made that some of the colored men, especially during very hot weather, were very objectionable because of the disagreeable odor from their persons, which was exaggerated by excessive perspiration, and it was necessary for me to direct several of the foremen to notify these men that they must pay more attention to bathing and frequent changes of clothing and, to give them every facility to comply with these instructions, I gave orders to have a shower bath placed in the colored men's dressing room. With regard to the segregation of the races in the work of the Bureau, I would state that this has not heretofore been fully enforced. 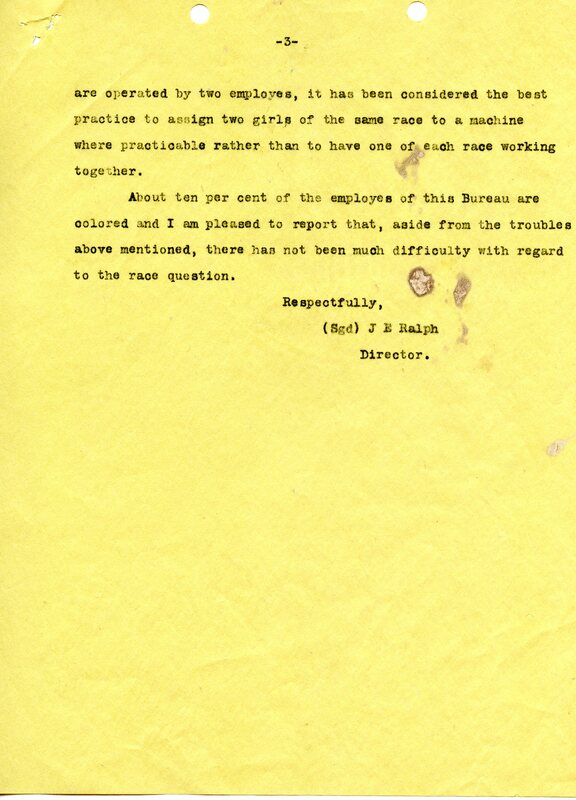 There are a great many printers' assistants who are colored, assisting printers who are white men, and as above stated, white and colored men are associated on similar work throughout the Bureau, but, in divisions where machines are operated by two employes, it has been considered the best practice to assign two girls of the same race to a machine where practicable rather than to have one of each race working together. About ten per cent of the employes of this Bureau are colored and I am pleased to report that, aside from the troubles above mentioned, there has not been much difficulty with regard to the race question. Ralph, Joseph E., 1863-1922, “Memorandum for Assistant Secretary Williams,” 1913 July 12, SE071213, Race and Segregation Collection, Woodrow Wilson Presidential Library & Museum, Staunton, Virginia.